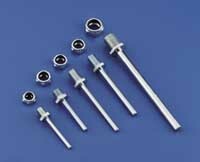 Dubro 1-1/4x1/8 inch Steel Axle Sft. Bolts to any dural landing gear. Easy installation. Available in four sizes. Comes complete with nylon insert lock nuts. Spring Steel Zinc Plated.